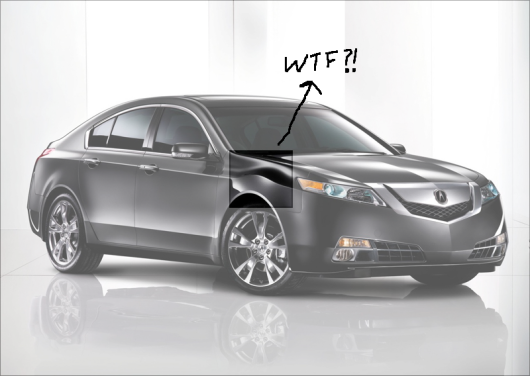 WTF is up with the 2009 Acura TL? I love my 2007 Acura TL. In my opinion, it’s the perfect mix of luxury and sportiness for the price. I love the way the engine growls when I step on the gas, and I love the way the body looks. For this reason, I was pretty excited to see what Honda would come up with for the 2009 Acura TL. When the 2009 TSX came out, I was even more excited because it looks pretty awesome and I was sure that Honda wouldn’t disappoint with the TL. Yeah. Seriously… WTF?! I don’t mind the grille. They seem to have borrowed that from the MDX, and the TSX has a similar one. It’s not bad at all – it’s pretty streamlined and aggressive-looking. But seriously, what the hell is up with that curve on top of the front-wheel. Seriously?! It totally breaks the streamlined look when you look at it from the side… it just looks bad! So yeah, I was a little disappointed, but I thought that the weird curve was something I could get used to. So then I tried to see what the rear looked like. The rear on the current generation of Acura TL is very nice. It’s imposing and it kinda raises up the rear of the car giving the entire vehicle a pointed, streamlined look. So what did they come up with for the rear of the 2009 Acura TL? What the hell, guys?! You kinda just took the rear of the 2008 Honda Accord and the 2007 Civic Coupe and squished them together to form a horrible ugly mess! I thought the rear of the 2007 Civic Coupe looks pretty nice. Even though the tail-lights were small, they were balanced out by the larger trunk door. I didn’t really like the rear of the 2008 Accord because the rear lights looked way too small. Honda seems to have taken the worst of both ideas to create the rear of the 2009 Acura TL. It has small tail-lights and a small trunk door. It’s just ugly. So yeah, I’m pretty disappointed. I hope in newer versions they will redesign the rear exterior (like how Honda does with the Accords and Civics), but I doubt that’s going to happen seeing as how they barely made any changes to the current generation from year to year. All in all, I don’t like the 2009 Acura TL, and I think they could have done a way better job. Guess I’ll have to wait till 2015 to see what they come up with next. hahahaha vivin! buttsekz HAHAHA I LOVE UR WORD! hahaha….n its so truee the new ones just looks like a mess!